Even before attacks in Cologne, the German chancellor decided to miss the annual shindig for the global elite. A fight for political survival means her hardest battles are now at home. Managing migration is Merkel’s biggest challenge, and her open-door policy looks unsustainable. Supporters of anti-immigration right-wing movement PEGIDA (Patriotic Europeans Against the Islamisation of the West) take part in in demonstration rally, in reaction to mass assaults on women on New Year's Eve, in Cologne, Germany, January 9, 2016. Attacks on women in Cologne and other German cities on New Year’s Eve have prompted more than 600 criminal complaints. 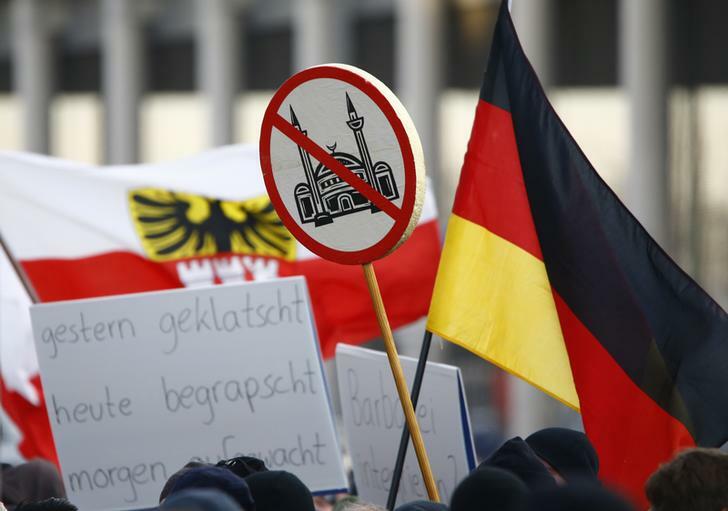 Ralf Jaeger, interior minister from the state of North Rhine-Westphalia, on Jan. 11 said that people of foreign descent were responsible for virtually all of the violence in Cologne, adding that this included migrants that arrived in Germany over the past year. The events are putting pressure on Chancellor Angela Merkel and her open-door migrant policy. The chancellor had already decided last year that she won’t attend the World Economic Forum commencing in Davos on Jan. 20.